Does Earth face a mass extinction of plants and animals? 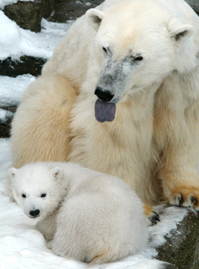 The polar bear may vanish as global warming melts Arctic ice. India's tigers and Africa's gorillas are also at severe risk, and thousands of other valuable animals, plants and insects are disappearing as tropical rain forests around the world are cut down. Twelve percent of birds, one-fifth of mammals and nearly a third of amphibians that have been assessed so far have been found to be imperiled. Many biologists conclude that humans are setting off a mass extinction that's exterminating 30,000 species a year — possibly as much as 10,000 times faster than natural evolution. Now honeybees have mysteriously gone missing from American farms, while coral reefs are dwindling and deep-sea fisheries are depleted. Many scientists fear that Earth faces an irreversible biological catastrophe even more severe than climate change, and that conservation efforts could be too late to preserve much of the planet's irreplaceable biodiversity.